About Karen Kane - History & Music Recording Industry Experience. 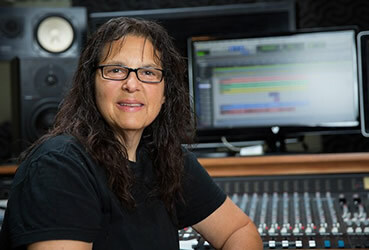 Inspired by attending Woodstock ’69 and music by The Beatles, Led Zeppelin, Pink Floyd, Neil Young, Fleetwood Mac, The Who, and others, Producer/Engineer Karen Kane has been in the music business for more than 35 years. She attended Berklee College of Music in Boston and graduated from the Recording Institute of America, where she obtained 2 diplomas in audio engineering. Early in her career, she managed a number of recording studios including the well-known 6 West Recording, a major jingle facility in New York City. Since the 1970’s, Karen has produced and/or engineered over 200 full-length album projects and has engineered hundreds of live sound shows. 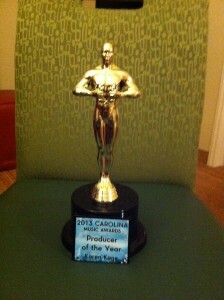 Currently, she runs her own audio production studio, Karen Kane Music Productions in Wilmington, NC. Besides music recording, mixing and mastering, her Wilmington recording studio is also where she teaches Audio Engineering and Music Production. Kane’s recording career was originally focused in the Boston area from 1974-1990 and in Canada from 1990 to 2002. While in Boston, Karen worked at Intermedia Sound, where the legendary album, “Dream On” by Aerosmith was recorded. Kane helped pioneer the way for women in audio by being one of the first successful female recording engineers, as well as one of the first successful freelance recording engineers (male or female) in the area. Karen is the author of numerous articles on recording methods and techniques published in Canadian Musician, Professional Sound, Sing Out and Hot Wire. Many of her articles can be seen on this website. In 2002, Kane re-located to Wilmington, North Carolina and continued her work as a Producer/Engineer and Audio Educator. In 2003, she launched 5 levels of audio engineering classes that are now in its’ tenth year. There are also one-on-one intensives or private classes catered to the individual. The classes are offered in January, April and September (Summer term is sometimes available). Registration forms are now being accepted for the next term. For more information, go to the Classes link on this website. Karen is pleased to announce that on July 6, 2013, she won “Producer of the Year” at the Statewide Carolina Music Awards in Raleigh, North Carolina. In 2014 and 2015, she was nominated again in that same category.